For several decades there has been a disconnect in many parishes between the directives of the Church and the music sung at Mass. And for a long time it didn’t seem likely or even feasible to change this state of affairs. One problem was the prevailing unawareness of what the Second Vatican Council actually said on this subject. While it is true that Sacrosanctum Concilium, the Constitution on the Sacred Liturgy (1963), did expand the kinds of music allowed in liturgical celebrations, it did so only in a limited sense: “so long as they accord with the spirit of the liturgical action,” with sacred polyphony being specifically mentioned as a prime example (no. 116). Rather than reflecting on the whole section on sacred music in the Constitution, attention focused on the phrase about expansion. 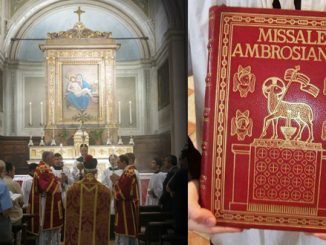 Likewise, most Catholics today don’t know that the General Introduction to the Roman Missal (20111) still prioritizes the use of antiphons in the options it gives for music for the Entrance and Communion. A “suitable song” is given only as the final of four options in which antiphons predominate, and yet songs have all but replaced antiphons in most parishes today. What has been completely overlooked by most parishes is the “inestimable value” the Council saw in “the musical tradition of the universal Church”; it was deemed a “treasure…greater even than that of any other art,” which was “to be preserved and fostered with great care” (112, 114). Also disregarded was the preeminence given to Gregorian chant; that same Constitution describes Gregorian chant as “specially suited to the Roman liturgy” and directs that “it should be given pride of place in liturgical services” (no. 116). Beyond that, most Catholics today are unfamiliar, and even uncomfortable, with Latin. Yet, because Gregorian chant melodies are meant to work in tandem with the words, simply applying Latin melodies to translated texts usually does not work well. directives on music for the Mass. That is, until the Ignatius Pew Missal came along. Father Samuel Weber, OSB first proposed the idea of a pew missal with simple entrance and communion antiphon chants to Father Joseph Fessio, SJ, founder and editor of Ignatius Press [which publishes CWR]. With an extensive education in liturgical music and extensive experience in teaching and composing it, Father Weber had already composed a great many Gregorian chants to accompany English texts for such Ignatius publications as The Proper of the Mass for Sundays and Solemnities, and the Mass settings for the new translation of the Roman Missal in the Adoremus hymnal. Ignatius Press welcomed the proposal and partnered with the Augustine Institute, which has connections with many parishes, to make the idea of an Ignatius Pew Missal a reality. Along with Father Weber, who composed the majority of the English chants for the Ignatius Pew Missal (IPM), another important collaborator in its production has been the editor, Brendon Ford, himself a former parish music director. In August 2017, Mr. Ford became Brother Elias Guadalupe Ford, a Dominican novice for the Province of the Holy Name of Jesus. Brother Elias has been granted special permission by his superiors to continue working on the project, at least until the Spanish version comes out this fall. The most recent addition to the team is Paul Senz, a prolific Catholic writer whose work includes quite a few articles for Catholic World Report, and who is also serving as sales manager for the IPM. 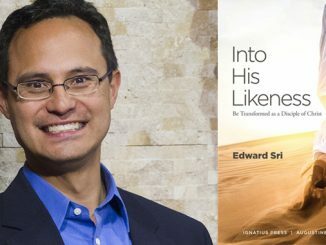 The aim of the IPM, Brother Elias told Catholic World Report, is to provide a resource to help the average parish “follow the documents of the Church and the desires of the Church, but in a way that’s more accessible.” The IPM does this in three main ways. 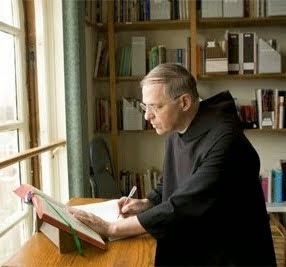 The IPM, first of all, helps the average parish learn and utilize Gregorian chant by providing the Entrance and Communion antiphons for every Sunday and solemnity of the year, set to simple, easy-to-sing Gregorian chant melodies, most of which were adapted or composed by Father Weber to work well with the English texts. “We chiseled it down to about 200 hymns to encourage music directors and parishes to focus on a small repertoire and learn that repertoire well,” he explains. They made a point to choose good hymns, without any faulty theology. 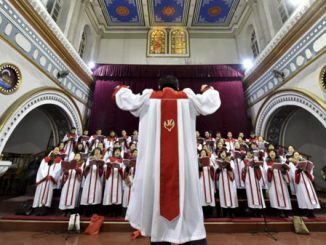 The selection includes well-known hymns (such as “Crown Him with Many Crowns” and “Praise to the Lord”), hymns they felt people should know (e.g., “Come Down, O Love Divine” and “Soul of My Savior”), and a small number of popular-styled contemporary works (e.g., “Here I Am, Lord”). If you produce a parish music resource, full of beautiful chants and hymns, the average American parish is probably going to reject it. They’re not used to that. For the last 40-50 years, we’ve had something different, as far as music goes. So we’re trying to bring people to a higher level of music and encourage their singing, but also meet them where they are. We want to give them something that they’re going to embrace, they’re going to love. So we have some hymns in there that we wouldn’t include in the ideal situation, but we can meet them where they are, and then from there introduce them into the beauty of the Catholic music tradition. 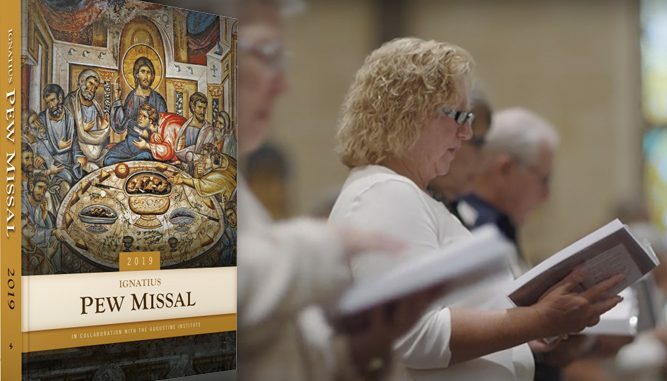 Third, the IPM provides not just beautiful and liturgy-worthy music, but as an annual missalette, it also includes the Order of Mass, the Sunday and feast-day readings, weekday Psalm responses and scriptural citations, and some additional prayers. The first Ignatius Pew Missal was released in 2014, so some CWR readers may already be using it in their parishes. The latest news is that the IPM team is working hard to release a Spanish version by Advent 2018. We’ve had a lot of different Spanish translations of many of the Mass texts floating around in the United States, because we have so many different Spanish-speaking communities, each from countries with different translations. Here in California, the biggest contingent is of Mexicans and Central Americans, but in Florida you have huge Cuban and Venezuelan populations; in New York you have a lot of Dominicans and Puerto Ricans. So there hasn’t been much unity for many of the texts of the Mass in Spanish-speaking parishes, especially the Ordinaries. So this Missal will be great because it will unify all the parishes with one translation for Spanish-speakers in the United States. The Spanish version of the IPM will essentially follow the same model as the English version. There are different melodies for the chants, still easily sing-able, but this time specifically suited to the Spanish texts. The Ignatius Pew Missal has been greeted with open arms, garnering a much higher demand than expected from the start—a demand that is continually growing: sales have doubled in a few short years. Our parish began using the Ignatius Pew Missal this past Advent with incredible results! As a congregation, we are now all singing together the proper Antiphons for each Mass. The layout is exceptional; the Mass settings are beautiful and accessible; and the hymns chosen are perfect! The square notes are so much easier to read for the congregation. This resource was indispensable this past Holy Week; I could not be more pleased. I highly recommend it! “and a small number of popular-styled contemporary works (e.g., “Here I Am, Lord”). The “problem” of using the chants of the Roman Gradual outright is that, to be blunt, they are, by and large, much too complex for the average congregant to pick up in a single hearing. My problem with the IPM is that the melodies they ultimately did use for these chants are too far different from the original melodies from the Gradual (or even the Simplex). They are originals, even more current than the 70s Glory and Praise standards dominating the current repertoire. It’s a step in the right direction, but it could have found that midpoint, simplifying the original melodies enough so that the articulation of those melodies matches that of the simplified, congregational-friendly form.